Grab your glue gun and get crafting! Connecticut features an array of locally-owned craft stores—some focused on general crafting and others with specific focuses like sewing, knitting, and model building. Many of these great craft stores also offer workshop hours and lessons so you can take your hobby to the next level or simply enjoy building a community with like-minded makers. Here are the best in the state! Hull’s Art Supply and Framing is a local store that caters to art students, teachers, and the general public. They carry an excellent stock of painting, drawing, print making, and crafting materials. To store all of your ample art supplies at home, Hull’s also sells storage needs like folios, bins, and empty jars. They also offer a children’s department for kids, so you can let your children’s natural artistic talents shine. For your convenience, you can order the supplies you need online. Jerry’s Artarama, open since 1993, sells fine art and framing supplies both online and in stores. It also conveniently sells school kits for classes offered at the University of Hartford, Manchester Community College, and Central Connecticut State University. Savings on these school kit bundles are significant, which is really important on a students’ budget. 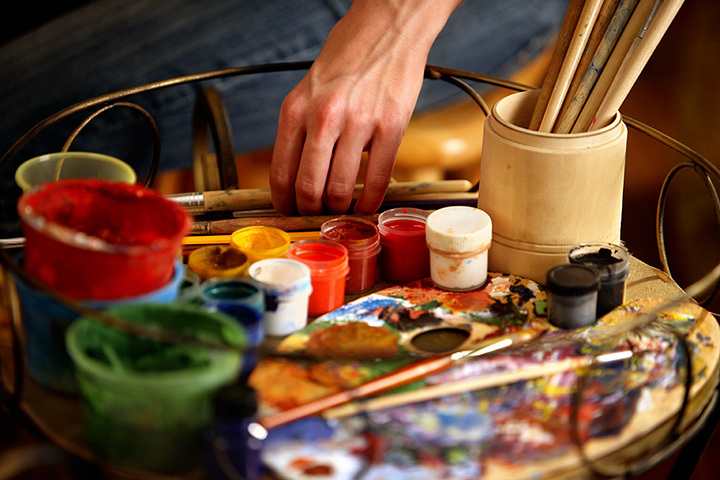 Other art supplies they offer include painting, drawing, brushes, craft, paper, and studio equipment. Get your artwork custom framed at Poster’s Arts and Crafts, or get the supplies you need to create your own special painting or memento. Poster’s Arts and Crafts also has numerous craft supplies for children to spend a fun rainy afternoon creating. They also stock yarn, paint, and needlepoint supplies. Colchester Mill Fabrics has sewing, quilting, and crafting needs and has been in business since 1975. This quaint, family-owned store is packed with a wide variety of quality fabrics, yarn, sewing notions, ribbon, trim, and knitting goods. They also frequently offer classes and open sewing time where you can work in the company of others while using one of their in-house sewing machines. In addition to selling such a wonderful array of toys, like LEGO and Playmobil, Lee’s Toy and Hobby stocks nostalgic model rockets and plastic, metal, and wooden models. Prepare your own car for the Pinewood Derby with kits, accessories, tools, glue, and more. You can even purchase stickers, decals, and paint to fully customize your Pinewood Derby racecar. In addition to model building and toys, they have craft kits, paint by number, and a small selection of other arts and crafts supplies. Just in time for the Pinewood Derby and other model building events and hobbyists, Heritage Hobby stocks plastic and wood models, kits, parts, glue, and paint. They also have an extensive selection of train sets and radio control gas and electric cars, planes, boats, and trucks. Model building is a great hobby for young children through adults and teaches focus and attention to detail. If you’re into knitting and crocheting, Mystic River Yarns has a massive selection of lace, baby, worsted, mohair, and even hand painted yarns. On their website, you can download free patterns to make hats, blankets, and scarves. They also frequently work within the nearby communities to donate money and time to needs such as the Warm Center in Westerly, Rhode Island. Village Wool is a great shop for knitters and yarn crafters, especially in its great discounted prices and frequent bag sales. If you’re interested in learning to knit, Village Wool offers drop-in classes every Wednesday evening from 6 to 7:30 p.m. They stock an impressive A to Z selection of yarn brands and sizes. Get crafty at A Stitch in Time with their abundance of yarn, needlepoint, crocheting and knitting supplies, and cross stitch goods. Though the store is incredibly well stocked, the staff are willing to order what you need if they don’t happen to carry it. A needlepoint open working time is offered every Friday, so you can come and learn needlepoint stiches and design techniques. Come check out the knitting supplies in store, or search the helpful website at Knit & Pearls. They carry monthly knitting magazines, yarn made from a variety of materials, needles, dye, and more. Other than for knitters and crocheters, they carry felting kits and tools. They offer knitting and crocheting lovers open knit on Tuesdays and Thursdays as well as regular hours for drop in help.